Watching free movies on YouTube is not a big deal, but you need to spend some time in searching for it and it’s not a cake walk to find full movies (most of those would be trailers and songs). How about using a catalog that allows you to find all free movies on YouTube? The Labnol fame Amit Agarwal has developed a free web application called “Zero Dollar Movies”, a catalog with more than fifteen thousand movies organized based on the year of release, and filters based on regional languages. Got interested? Let me walk you through the app. Zero Dollar Movies, sports a very simple interface. It means, you will not find any complex menus or buttons. But features a simple pull down menu that allows you to filter movies based on languages (English, Bollywood, Tamil and Telugu) and by the year of release (starting from 1914 till date). Interestingly, every new title will be added to the application as and when they release on YouTube. The application also has an Instant search feature, which allows you to search for your favorite movie that are free on YouTube. The search feature is quite intelligent, it means if you are searching for a movie title from India, then you will only see results that matches your geographical location. You will also find red-green bar at the bottom of each video thumbnail, which indicates the ratio of likes and dislikes. According to the developer, the app is still in early version and more features (such as inclusion of IMDB and Rotten Tomatoes movie databases) will be added in coming days. 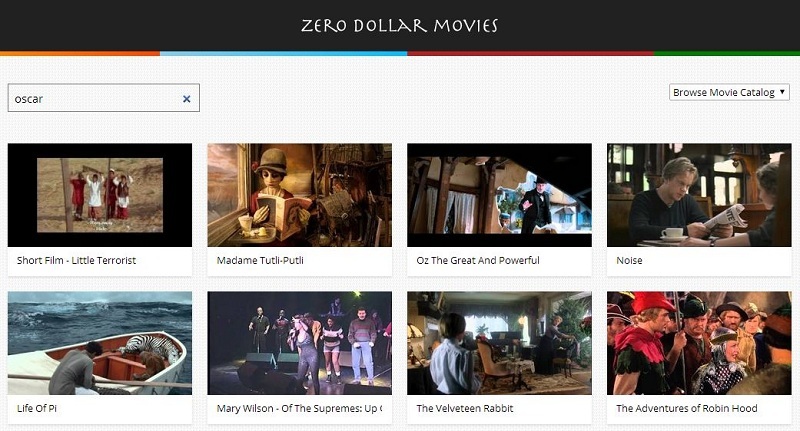 visit Zero Dollar Movies | A Free movies catalog for YouTube. American movies are NOT free. Some of the other movies are free but not the American ones. Why is this? Stop false advertising.